The bestselling author of Faith and The Condition returns with a collection of unforgettable short stories inspired by a Pennsylvania coal-mining town and the people who call it home. When her iconic novel Baker Towers was published in 2005, it was hailed as a modern classic--"compassionate and powerful . . . a song of praise for a too-little-praised part of America, for the working families whose toils and constancy have done so much to make the country great" (Chicago Tribune). Its young author, Jennifer Haigh, was "an expert natural storyteller with an acute sense of her characters' humanity" (New York Times). Now, in this collection of interconnected short stories, Jennifer Haigh returns to the vividly imagined world of Bakerton, Pennsylvania, a coal-mining town rocked by decades of painful transition. From its heyday during two world wars through its slow decline, Bakerton is a town that refuses to give up gracefully, binding--sometimes cruelly--succeeding generations to the place that made them. A young woman glimpses a world both strange and familiar when she becomes a live-in maid for a Jewish family in New York City. A long-absent brother makes a sudden and tragic homecoming. A solitary middle-aged woman tastes unexpected love when a young man returns to town. With a revolving cast of characters--many familiar to fans of Baker Towers--these stories explore how our roots, the families and places in which we are raised, shape the people we eventually become. 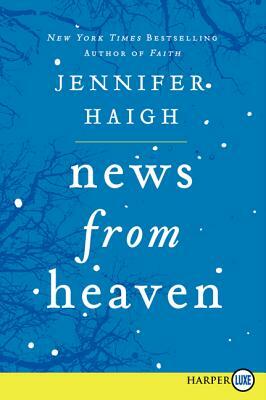 News from Heaven looks unflinchingly at the conflicting human desires for escape and for connection, and explores the enduring hold of home.